We find it quiet hard to write in simple words what we had to witness in those 3 hours at Auschwitz. We started our journey from Warsaw to Krakow which is a mere 5 hours.. the journey to Krakow reminded us as we distantly glanced out the window at the journeys our fellow brothers and sisters took to reach the concentration/labour/death camps by cattle trucks or along the railway roads.. we all look out the window and see the same thing although almost 70 years later buildings have now been established, trees destroyed but the same distinct forests rest amongst the roads that millions of Jews to took to their final destination. During our tour of Auschwitz one of a few things stood out for us was unity, When humans are placed in difficult situations the common human reaction is to isolate and drift away, but unlike most religions, Jews unite despite the hate of the religion, the traumatic treatment they received for their identity, but the love for the religion was brought into even the gas chambers where Magen Davids were scratched into the walls in their final seconds.. These numbers may seem odd to you but 46 is the number of camps that were created in Auschwitz..
46 camps lay amongst the town of Krakow, how can anyone grapple with the thought that 46 camps just in one area, existed freely. 1.3 million is the number of lives taken, innocent lives taken because of their identity at just this camp and 19, 19 hours...these are the seconds millions of Jews had to stand on a winter night in the role call area of Aushwitz one, in their thin clothing and weak legs they stood for a 19 hour role call .. Entering the camp we felt as if we were entering a movie set this may seem terrible to say but it's the head phones, tour guides, foreigners and fast food vending machines which took away the feeling of death and despair outside the gates but as soon as we passed the Arbeit Macht Frei Sign we knew we had entered a place full of pure evil. The museum itself is the original camp, although the renovations took place only in the inside of the buildings which have been altered for visitors, a fresh coat of paint on the walls, some new tiles have been laid and historic artifacts have been placed behind glass, the different rooms we entered each had its own emotional rollercoaster, we were able to read a book filled with everyone's names that had been recorded in the holocaust, walked in the foot steps of millions of prisoners and entered rooms which left us gutted. The rooms which "exposed" the corpses should never been spoken about again and the stories we were told have become life lessons which can be taken into account for the rest of ones life. Today as we remember everyone in the holocaust, we remember that 6 million is not a number, it's not just a number we say we going to remember, it's individuals, each person has there own story from the man at Aushwitz who let the soldiers kill him because the man they actually wanted had a wife and kids, or the little boy who sold cigarettes on the bench and had his baby sister die in his hands, each story represents a struggle not just the struggle against the Nazi Regime or the struggle against the evilest of the 1940s but the struggle against humanity. We say never again but do we actually understand what words we are saying. We are saying NEVER shall we let anyone disrespect, hurt, kill, or discriminate again. Another stunning morning in Israel began with a tour of the ammunition factory in a kibbutz near Haifa. This factory was the power house behind the production of ammunition between 1945 and 1948 leading up to the War of Independence. Such production was forbidden by the British mandate and this offense could easily get them arrested or even a harsher penalty. This bravery and determination to never give up on fighting for their country made these normal people living on a simple kibbutz into heroes that contributed to the victory in the War of Independence. We spent our afternoon roaming around the electric atmosphere of the Carmel market. We enjoyed the variety of the stalls alongside the street and overall had a great time. My favourite street was the arts and crafts where people used their creativity to produce magnificent pieces of art, whether in the form of wood work or jewelry. We prepared for what was destined to be a magical Kabbalat Shabbat at the Kotel. We davened in harmony and soon after were singing and dancing right in front of what has to be the holiest place on Earth. Even when walking up to the Kotel to pray, I felt as if all of my senses turned on and the spiritual presence felt so divine. We then made our way on a long walk back to the hotel for a great Shabbat dinner. Poland is a sad city because the people living there every day have to wake up mindful of the past (the ones that acknowledge the past). They carry this heavy burden on their shoulders day by day. That cold day we visited a mass grave of children, women and men that were shot in the forest by the SS. We saw the holes dug to bury these poor soles. We walked in the forest and saw the graves. It was tough, but I didn't cry. I couldn't wrap my head around it all. I guess it was too much for my young brain to absorb and process. I just acknowledged their lives that they lost and realized I'm still here and can make a difference . They are dead, there is nothing that can be done, (as harsh as it sounds) but we, who are present must inherit their lives and dreams into our own lives and dreams, and live life to the fullest in their memory because they couldn't and we can. The scary thing is that, we walked into the forest just like them, except we walked out the forest and returned to our daily privileged lives, and for them- that was the end; they didn't walk again, they stayed. 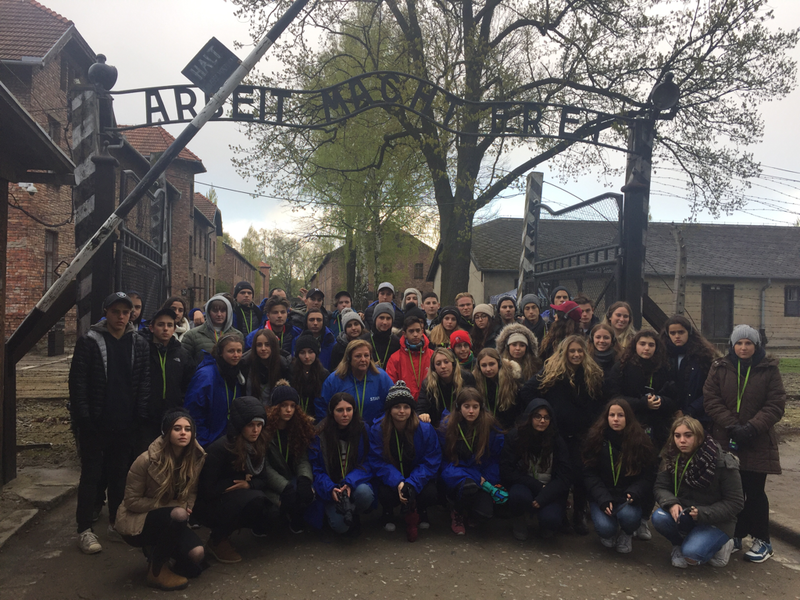 The group standing in Auschwitz I under the infamous sign: "Work will set you free."